Back in January I was lucky to be part of an open house at The Barn at the Springs. I was totally blown away by the turnout. I was expecting maybe 50 people. I think there were 200! Anyway, during the open house, I gave away a free engagement session. 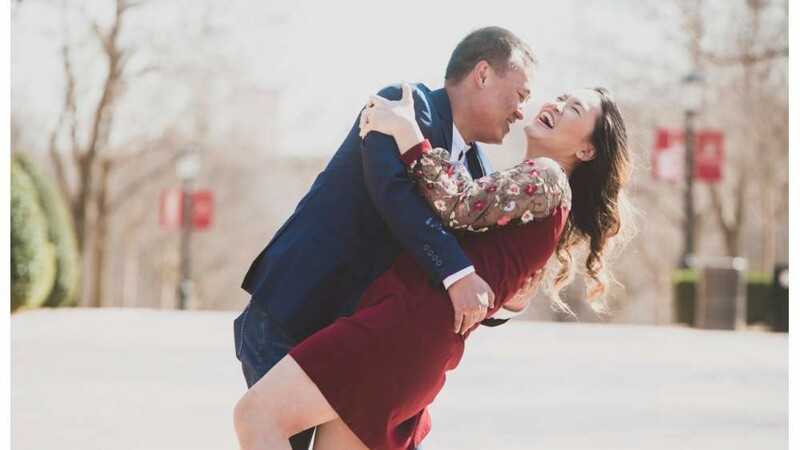 A few days ago, I got to meet up with the winners, Anh and Teng, for their engagement photos on the U of A campus. Anh chose the U of A campus because she graduated from there, so we met at Old Main. Our first stop was her name on the senior walk. Luckily, it was right by Old Main. I got a few shots of the rings right beside her name. It was a bit of a challenge because her name was long, but I think it turned out. Teng’s idea was next. He wanted a proposal photo, so I put them out in front of Old Main and we faked it. It’s hard to fake that kind of surprise and emotion, so at the very end, I just had him give her a huge hug. From there, we wandered to a few different spots and just figured it out as we went. There are so many nice locations at the U of A. I try not to have too much planned. Sometimes there’s construction going on, so it’s better to not have any plans. This was my first time really getting to talk to Anh and Teng, so I was asking them all types of questions. One of the most interesting things I found out is that they own a restaurant together: Thai Cuisine. I’ve never had Thai food before (I know, that’s a surprise), so I had even more questions for them. Hopefully in the near future, I’ll be able to make it up there and try out their food. These two are getting married in about a month, so I’m really glad I got to meet them and work with them before the big day. I found a new restaurant to try out and met a fun and easy going couple. What a great day for engagement photos on the U of A Campus!